Choosing an ergonomic office chair with a tight budget can be puzzling. Yes you will be saving some bucks but what about the longevity? Will the chair be enough ergonomic and comfortable? There are lots of thoughts which can get into your way. Need a new office chair? Have a budget to consider? Check out our top pick. This is the most beautiful office chair under 200 dollars. You will love it! It is not necessary to have a high budget to buy a great office chair. However, it is not easy to pick an excellent office chair in a less budget as well. So we did all the homework on your behalf and prepared this buyers guide of the top performing office chairs that are surprisingly budget-friendly. This article aims to make your working hours more productive at the most affordable price. So if you are looking for the best office chair under $200, this article is the crunch point of your search. The Office Factor Ergonomic Executive Office Chair is a modern office chair that delivers ergonomics and comfort for long sitting sessions. It is one of the lightest ergonomic chairs that weighs just 34 lbs and highly portable. You can quickly move the chair around from one place to another without a sweat. The armrests on the chair give you flexibility as both the armrests flip up. So you can also shuttle large objects around pretty smoothly. The back of this chair reclines along with the seat. So your whole body will tilt while leaning back. The chair has a double handled mechanism that allows you to lock the back of the chair at any position. The base of the chair is pretty big and gives excellent stability. The gas lift mechanism is of industry standard and provides improved performance. The adjustability level of this chair is very high. The chair includes two handles to operate the ergonomic features and also lets you lock the back of the chair at any position you prefer. The chair has a dimension of 26 x 28 x 44 inches which is pretty convincing itself. It has an impressive weight capacity of 250 lbs. So, almost all type of users can use it comfortably. The armrests flip up and are easy to use. The seat is covered by high quality bonded leather that provides excellent comfort throughout the day. The overall construction of the chair is sturdy and durable. It swivels very well and has smooth casters that protect the surface while rolling on it. Solidly built for extreme durability. Seat recline angle can be locked. The seat foam is thick and super comfortable. Assembling is super easy and you don’t require any special tools to assemble this office chair. Gives 5 year limited warranty. The Boss Office Executive Chair is a top choice for big and tall users. It is considered as a reliable and robust office chair that lasts very long. The components used to build the chair are industry standard. This chair also includes necessary ergonomic features on top of its raw strength of holding large capacity. The chair has a reliable tilt mechanism that includes infinite locking system. It will help you to lock the chair and maintain an angle that fits your needs. It also keeps your body and back correctly aligned. The chair has a pneumatic gas lift which helps to adjust its height. The chair’s built in lumber provides additional support to the lower back. It has a five-star foundation base of 27″ and can swivel 360 degrees for rapid movement throughout your working space. It helps you to do multitasking while you are sitting and move around without any interruption. The chair has a deeply layered seat cushion with plush padding that ensures supreme sitting comfort. The boss office executive chair has a dimension of 31 x 33.5 x 45.5 inches which is suitable for almost all size of users. The capacity of this chair is also 350 lbs. Hence, the boss name is a perfect fit for this chair. The bonded leather of this chair is of superior quality. The black curved armrest gives additional support to your hand, wrist and forearms consistently. It has three double wheel casters that allow you to move around safely and silently. Durable design for everyday rough use. Ergonomic tilt mechanism with locking adjustment. Deep layers of double plush padding. Easy 360 degree swivel action. Assembling may be little tricky. The chair is trendy for its looks and comfort. It has a great curved back and a contemporary design that gives the chair a stand out appearance. It has a mid-back design that offers extra support from mid to upper back area. 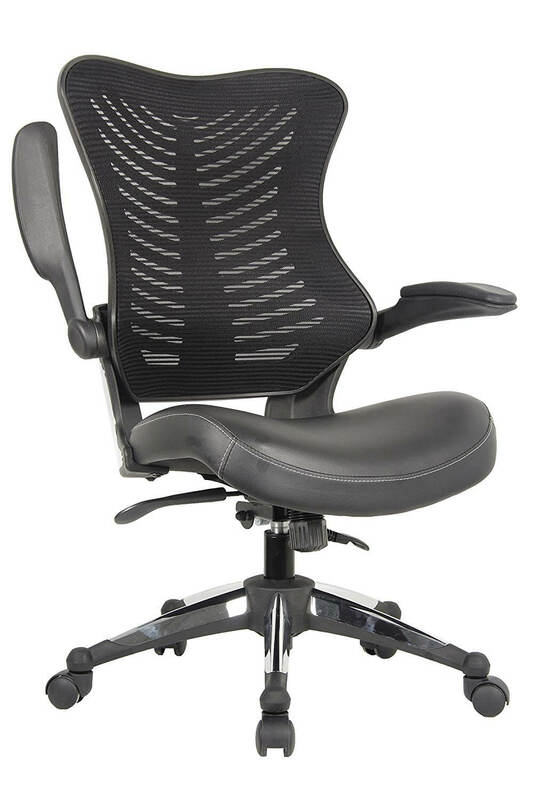 The curved mesh back provides excellent lumbar support. The chair has adequate ergonomic features to support you throughout the working day. The back is well supported on this chair and also the padding is sufficient. It has a leather upholstered seat that is designed with a waterfall front edge. It eases your legs while sitting for long hours and improves blood circulation. The armrests of this chair can be flipped up and down. They are padded by leather and are very comfortable for your arms to relax. You can pull it up when you do not need it and use the chair as an armless chair. You don’t have to take the time and effort to detach them separately. The breathable mesh material on the chairs back ensures proper air circulation while you are sitting too. The chair has a dimension of 34.4 x 26.2 x 25 inches and pretty much usable by almost all type of users. The weight capacity is impressive as it supports up to 250 lbs smoothly. You can adjust the seat height according to your need by the built-in pneumatic adjustment lever. The double wheel casters on the chair let you to swivel easily without damaging the surface or making any noticeable noise. Had a built in lumbar support. Waterfall edge on the seat helps blood circulation on legs. Good capacity at a good price. The seat cushion may become flat after some time. Assembling may take some time. Sometimes, typical office chairs may not be comfortable for taller and bigger users. The AmazonBasics Big & Tall Executive Chair is a thumbs up for those users who fall into this category. This chair nails it in its sleek and professional appearance. The chair has a sophisticated support system that ensures comfort to the users. The chair supports your back and keeps your body accurately aligned. It has adjustable settings and curved contours which are important ergonomic features if you are spending long sitting hours. The chair has a flexible lumbar mechanism that provides extra support to your lower back. It also includes a tilt mechanism that allows you to set the preferred angle you want. It has a pneumatic control handle that allows you to adjust the height of the chair. You can pull the chair up or down quickly by the handle. It has a comfortable seat cushion and back cushion padded competently. Both are covered by smooth and supple leather. The seat cushion has a deep layer padding that gives supreme comfort through long sitting hours. The armrests are also padded by matching bonded brown leather. The chair has a dimension of 29.5 x 27.2 x 47 inches and a large weight capacity of 350 lbs. The chair holds up and supports great weight smoothly. The overall built of the chair is reliable and durable. You can swivel the chair 360 degrees and move around from one place to another by its durable casters. It allows you to be agile and perform multitasking efficiently. Built with industry standard components for long time use. Top quality bonded leather material. Installation takes very little time. Very high capacity that can accommodate up to 350 lbs. The chair comes with an infinite tilt locking adjustment. The seat on the chair may lean a little left or right after long use. The padding may feel little lighter to some users. The KADIRYA Leather Executive Office Chair is great for long sitting hours. The chair keeps your spine correctly aligned and supports your lower back properly. It has a look that is a balanced mix of modern and vintage touch. It has an elegant design and is built with strong, durable components for long years of usage. This chair is covered by high quality bonded leather which gives a comfortable sitting experience. The back of this chair is designed to provide maximum lumbar support. It also has a waterfall seat edge that keeps your legs relaxed and ensures a much better blood circulation. The chair has soft padding as well, so you are comfortable all day long. The maximum reclining angle of this chair is 120 degrees. It allows you to lean back comfortably and rest when you are a little tired of working. There is a tilt tension knob right underneath the seat that makes the reclining easy and safe. The arms can be flipped up too. It gives you the option to convert your chair into an armless chair as well. The chair has a dimension of 30.7 x 25.5 x 14.8 inches and a weight capacity of 250 lbs. So it is a chair that almost anyone can use easily. The 360-degree swivel allows you to do multitasking smoothly. The heavy duty nylon base and rolling casters let you move around comfortably without any damage on the surface or disturbing noise. The chair is made of high-quality leather and PVC. An armrest can be flipped up. The Serta Air Health and Wellness Executive Office Chair is a health and safety focused ergonomic office chair for modern day work environment. The Serta Company has been providing quality comfort products for 75 years and still going strong. It is one of their products that is popular for its comfort and health friendly design. It has a unique AIR lumbar feature that flexes and pivots with your body as you lean. It has a mesmerizing overall aesthetics. The chair includes all the ergonomic features a user would need for work efficiency. The user can adjust the chair according to his movements and requirements pretty easily. It is a handy office chair that takes good care of your work stress and health throughout the day. The chair includes an Air Kinetic with its lumbar support that keeps adapting your movements. You can experience an excellent sitting time as the chair has ergo layered body pillows. So your back is well supported through extensive working hours. You can adjust the tilt of this chair and also the height. The armrests are softly padded for your maximum comfort. The dimension of this chair is 29.8 x 25.8 x 42.8 inches and the overall weight capacity is 240 lbs. So, almost anyone can use this chair with ease. The chair is covered by high quality bonded leather. It has a pneumatic lift including adjustable tension and lockout features. The armrests are accurately positioned and provide utmost comfort to your arms. It swivels smoothly and has a heavy duty base. Great padding that provides ample support. Built in strongly and ultra durable. The chair has agile and surface friendly caster wheels. The price is pretty affordable. Assembling may take a little while for some. The armrests are not adjustable. The TOPSKY Ergonomic Office Executive Chair has a robust structure and design including plenty of work efficient features. This chair is worth your time to look at as it has enough ergonomic options that will be valuable to you. It has a sleek and modern design that contains ergonomic features head to toe. It has all the adjustable features including a hanger on the back for putting clothes. Overall, this is one of the sturdiest ergonomic chairs in the market. The chair has highly breathable quality mesh material on the back of the seat. It will let you to be comfortable even during the hottest days of summer with proper air circulation. The headrest of this chair has a unique 3D adjustment. You can adjust the height of the chair and also the angle that fits the best to you. There is a knob on the outside of the chair that allows you to adjust the lumbar support. You can move the lumbar support back and forth using this adjustment. The armrest can be moved up and down. Both the armrests are very well padded and give great relaxation to your tired arms whenever you need. The chair has a dimension of 24 x 26 x 44.5 inches and a capacity of 330 lbs. The chairs height and weight are adjustable so it will be a great fit for users of almost any size. The chair can be swiveled to 360 degrees and also includes a tilt up to 145 degrees. Lumbar support and headrest is adjustable. High quality mesh material ensures great air circulation. Armrests are well padded and height adjustable. There is a hanger on the back that is very helpful. Headrest may not feel very sturdy. Assembling may need some time and effort. Moodway mesh office executive chair is a fantastic ergonomic chair that displays a touch of modern style and bites. The chair’s back seat is covered by breathable mesh that allows continuous air circulation while you are sitting for long hours. The chair hinders the excessive heat and makes you feel comfortable throughout the day. The chair has a plush fabric cushion on the seat. It will give you additional comfort if you are spending longer sitting hours in the office. You can easily adjust the height of the chair, seat and back as well. There are a tilt and lock function available with the chair. It lets you control the reclining and incline smoothly. The chair also includes five hooded dual-caster wheels which make it very agile. You can move around quickly and do your work without having to stand up frequently. The caster wheels are surface-friendly and roll without damaging your floor or creating any disturbing noise. The chair has a dimension of 27.5 x 26 x 41.5 inches and capacity of this chair is pretty high as it can carry up to 331 lbs. It’s a sturdy and robust chair that includes industry standard components which will last for years to come. The chair has a 360-degree swivel option that allows you to perform multitasking while sitting comfortably. Overall, it can be the perfect office chair for you at this price. It’s fully adjustable, breathable and usable for rough and long working hours. It is also a good back friendly office chair. Great airflow through the breathable mesh material. The seat cushion is very relaxing by its thick foam. The height, back and armrests are smoothly adjustable. The overall design is modern. The price of this chair is very reasonable. Padding may appear little less to some users. The Hbada Ergonomic High Back Office Chair uses mesh design. The mesh material of the chair keeps you cool even during the hottest days of summer. The chair is famous for having impressive ergonomic features. The swivel, lumbar support and reclining features of this chair are very flexible. The seat of the chair is covered by quality fabric and padded with foam. So it is very comfortable to sit for long hours. The chair has a variety of ergonomic features. The height of the chair can be adjusted from 40.8 to 44 inches. So, taller users can use this chair easily. The back of the chair is very well ventilated. The mesh material used on this chair ensures proper breathability. So, you will get enough air circulation when you are working under hot temperature and you won’t have sweating issues with this chair which is very common with leather made chairs. The chair adapts to your movements easily. It has a kinematic tilt mechanism that makes you control the chair to cope up with your body motions. You can adjust the reclining of this chair from 90 to 150 degrees. You will also have the option to lock the position of this chair at an angle you find suitable for you. The headrest of this chair is detached and adjustable. So it will provide the best support to your head and neck. The dimension of this fantastic chair is 26.8″(L)*26.8″(W)*44.5″-47.6″(H) and the capacity of this chair is 330 lbs. So it fits almost all type of users. Breathable mesh makes the chair air friendly. Height adjustable in multiple ways. High capacity and durable construction. If you are looking for a standard, typical office chair that also includes ergonomic features and durable, then the Homycasa fabric office chair can be one of your selections. It comes with an elegant design and consists of some of the handiest ergonomic features you can least expect at this price. The chair is made of the top quality metal frame. It’s covered by soft fabric and PU materials with high endurance. You can use a vacuum cleaner to remove all the dust off the seat. You can also use a rag with a pledge to clean up the PU leather. To clean up the armrest and the frame, use water and detergent. The height of the seat is adjustable from 46.1-50.8 Inches. The chair has smooth rolling casters that allow you to move around pretty quickly. You can do multitasking conveniently while just sitting on the chair. The chair has a 360 degrees swivel feature that is easy to rotate in all direction. It gives you the perfect support for head and back by its high backrest. The chair’s height is also adjustable. So users of different height can use it. The chair has a dimension of 26.8 x 26 x 50.8 inches and capacity of 350 lbs. That makes it pretty usable for different type of users. The chair is ideal for men, women, teens and almost for anyone who wants to use it. Big capacity and can accommodate different users. Thick padding and superior comfort. High quality PU and Fabric material. The lower half of the chair may not be very sturdy. The seat may appear little short to some users. So if you are trying to find the best office chair under $200 that is not being a tightwad. You may feel like biting the bullet when you are thinking to buy a good office chair at this price. There are plenty of reasons which can create a lot of anxiety. However, if you check your surroundings, you will find a lot of excellent, reliable and great stuff that is not expensive. Nothing can be more beautiful than getting the best product at the least price. The chair must be able to adjust to your body type, sitting position and angles the way you find it comfortable. It includes lumbar support, height, armrests, backrest etc. It should also be mobile enough to move around smoothly. The chair should be able to bypass enough air to your body while you are sitting for an extended period. We all sweat and our body release moistures when we sit. So if the chair is not getting enough air to go through, it will be uncomfortable for sitting for a long time and work. The chair must be supportive of your working process. It has to support your neck, spine and body correctly. It should let you move around fast and also let you lean both back & forth. The chair should let you adjust the height, armrest, footrest, backrest and even the sitting position. We all know leather materials are long-lasting. However, fabrics win the race when it comes to breathability. On the other hand, leather chairs are more expensive and fabrics come at a lower price with equally long durability. So if you are looking for a chair that will last longer and be more comfortable at work, then fabric chairs can be a great choice considering the price. Your chair should have a back that can be adjusted by any angle and degree that fits best to your body posture. It should also have a locking mechanism that can lock the chairs back at any angle. So you can sit the way you are most comfortable. This is not significant but to have this feature on a chair that comes under $200 is a bonus! This feature lets you work comfortably on desks little higher and gives great comfort to your tiring arms when they need rest. The seating area of a chair is a significant consideration factor. We use chairs to sit and that is the primary objective. So, always check the padding, size and how supportive the seating area is for extended working hours. It all comes down to the price at the end. But it should not be the only judging factor when it comes to buying an office chair. There are plenty of chairs with impressive ergonomics which can be bought for a relatively lower price. However, a small price tag should not confuse you as the good stuff is not always expensive to have. So which one is the best office chair under $200? All the ten chairs that we reviewed in this article are the pick of the litter in the market. If you are looking for a chair that comes under $200 with sufficient ergonomics, then all the ten chairs can fit into your needs. However, The Office Factor Ergonomic chair that we mentioned in number one has a five years warranty. It also includes almost all economic features that you may find in chairs that have a much higher price tag. The Boss Office chair is highly durable with great flexibility. It has almost all sort of work efficient feature that you will love to have. Moreover, it has a large capacity of 350 lbs which is incredible. The Serta office chair is recognized as a health and wellness office executive chair. It has the required ergonomic options and the manufacturer of this chair is a renowned organization that has been providing quality comfort products for 75 years. So it all comes down to what you exactly need. That’s why we prepared this review so you can see, check and asses the top ergonomic chairs that come at a reasonable price and strike an attractive deal. It’s fine if you want to replace that uncomfortable chair which you have right now that brought to you here to this article. The list here is comprised of the most cost-effective, ergonomic and comfortable office chairs you will find in the market. No matter which one you select from this list that will be a good investment you will be making. So grit your teeth and grab the chair which you find suit you the best! Bring your brand new, tip-top and shiny office chair that comes at a happy winning price.